I am so excited and honored to have one of my talks turned into a podcast! I gave this talk during MOPS International’s Coach training in Milwaukee last fall. The whole experience was humbling and surreal. I praise God for leading me out of my comfort zone and stepping into new things for His glory. I thank MOPS International for believing in me and allowing me to share my heart. I hope you will listen, be blessed and be encouraged. 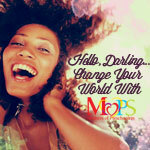 If you would like to know more about MOPS International and what they do, I would love to talk with you. This entry was posted in EMBRACE Leadership, EMBRACE People and tagged connections, embrace life, EMBRACE People, embracekindness, faith, inspiration, kindness, leadership, life, MOPS International, podcast, relationships, speaking. Bookmark the permalink.